As darkness falls on Monday the bright star Aldebaran can be seen directly overhead. Aldebaran is the brightest star in the constellation Taurus and one of the brightest stars in the nighttime sky. It has the Bayer designation Alpha Tauri. Because of its location in the head of Taurus, it has historically been called the Bull's Eye. Aldebaran has the appearance of being the brightest member of the more scattered Hyades cluster, which is the closest star cluster to Earth. However, it is merely located in the line of sight between the Earth and the Hyades, and is actually an independent star. 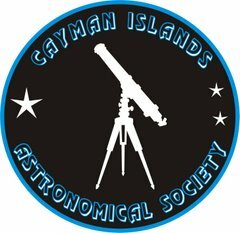 In 1997, a possible substellar companion was reported, with a mass at least 11 times that of Jupiter with an orbital period of around 2 years, however this has not been confirmed. Aldebaran is a K5 III star, which means it is orangish, large, and has moved off of the main sequence after exhausting the hydrogen fuel in its core. It has a minor companion (a dim M2 dwarf orbiting at several hundred AU). Now primarily fusing helium, the main star has expanded to a diameter of approximately 5.3 × 107 km, or about 38 times the diameter of the Sun. The Hipparcos satellite has measured it as 65.1 light years away, and it shines with 150 times the Sun's luminosity. With an apparent magnitude of 0.87, it is the 14th brightest star. The name Aldebaran comes from the Arabic (الدبران al-dabarān) meaning "the follower" and refers to the way the star follows the Pleiades star cluster in its nightly journey across the sky. In Persia it was known as Satvis and Kugard. It is known as 畢宿五 (Bìxiùwŭ, the Fifth Star of the Net) in Chinese. 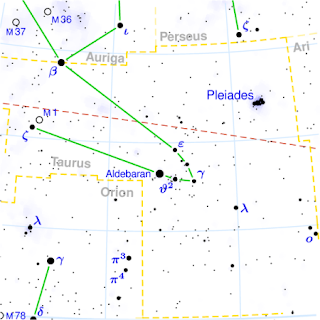 Aldebaran is identified as the lunar mansion Rohini in Hindu astronomy and as one of the twenty-seven daughters of Daksha and the wife of the god Chandra. The Romans called it Palilicium. For the Dakotas (a branch of the Native American Sioux tribe), Aldebaran took on a heroic aspect. The young star was the child of the sun and the lady Blue Star. One day, he desired to hunt the white buffalo (the Pleiades). After he pulled up a sapling to make a spear, a hole was made in the ground and he could see all the people of Earth down below. The white buffalo took this chance to push him through. He was found by an old woman and was to be known as Old Woman's Grandson. On Earth, he killed many strange monsters that had been troubling the Native Americans; one monster of which was a serpent that caused drought. The young hero killed the serpent, releasing a great stream of water that became the Mississippi River. In time, Old Woman's Grandson remembered the white buffalo and returned to hunting him in the sky to fulfill his destiny. For the Seris of northwestern Mexico, this star is providing light for the seven women giving birth (Pleiades). Noticeably redder, and brighter, is the nearby planet Mars. Mars is close to the β (beta) star of Auriga on the illustration above. Called Menkalinan, it is a double star consisting of two blue white giant A2 class stars. They have magnitudes of 1.9 and 2.7 and are 90 light years distant.